This Refill Pack contains 2 foam-tipped Ultra Stomp Rockets. This Refill Pack works with three different Stomp Rocket Launch Kits. Launch these rockets up to 200 feet in the air using the Launch Pad and Launch Stand in The Original Stomp Rocket: Ultra 4-Rocket Kit (20008). You can also launch these rockets up to 200 feet in the air using The Original Stomp Rocket: Dueling 4-Rocket Kit (20888), with a special Dueling Launch Stand that allows two kids to launch rockets at the same time! This Refill Pack also works with the Launch Stand and Launch Pad in The Original Stomp Rocket: Combo Pack 30-Rocket Kit (20855). Ages 6 and up. This Refill Pack contains 2 foam-tipped Ultra Stomp Rockets. This is a RefillPack for three different Stomp Rocket products. Launch these rockets up to 200feet in the air using the Launch Pad and Launch Stand in The Original StompRocket: Ultra 4-Rocket Kit (20008). Or you can also launch these rockets up to200 feet in the air using The Original Stomp Rocket: Dueling 4-Rocket Kit(20888), with a special Dueling Launch Stand that allows two kids to launchrockets at the same time! This Refill Pack also works with the Launch Standand Launch Pad in The Original Stomp Rocket: Combo Pack 30-Rocket Kit (20855).These Stomp Rockets are 100% KID powered! 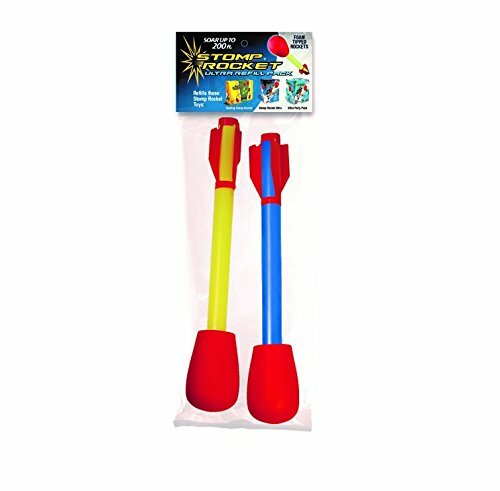 Ultra Stomp Rockets are strong anddurable, and great for active, outdoor play. Stomp Rockets have won lots ofawards from industry experts, including iParenting Media, Dr. Toy and CreativeChild Magazine. For kids ages 6 and up.